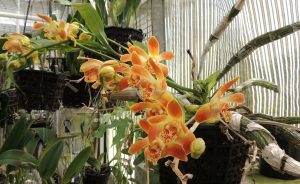 Another plant looking great in the greenhouse this week is Chysis aurea with four spikes of large orange and gold flowers. This glorious species is native to warm forests in Central and South America. It grows long thick pendulous bulbs each summer and then loses its leaves during the winter before sending out these lovely large flowers on long spikes from the base of the new growths. We keep the species in a bright spot in Warm Americas with lots of water during the summer but an almost dry winter with just enough water to stop the pseudobulbs from shrivelling. We also need to be careful not to get too much water around the soft new growths in May and June or they can rot off.